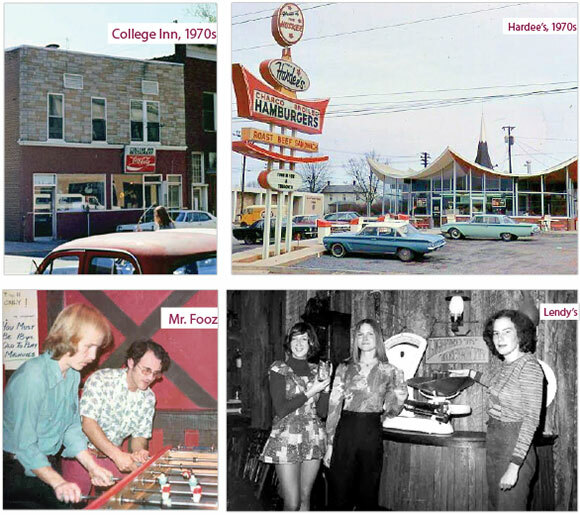 The burger joint where you met your spouse, the bar and grill where you and your buddies deposited the Lane Stadium goalposts, the pizza place where you studied your entire senior year: Revisit your favorite Blacksburg restaurants across the decades. Unless otherwise noted, photos are courtesy of Historical Photograph Collection, Special Collections, University Libraries, Virginia Tech. It was the Busy Bee Restaurant. Nobody called it the Busy Bee Restaurant. They called it 'the restaurant owned by the Greek.' 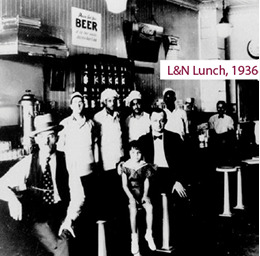 Around the time Prohibition was over, his friend Louis Karanikas joined him, and they changed the name to L&N Lunch. Nobody called it the L&N Lunch. It was 'the restaurant that the Greeks own.' Louis died, and my father changed the name to the Blue Ribbon. Nobody called it the Blue Ribbon. It was still 'the Greek.' That's how the name Greek's came about." When my husband and I got married, he still had a year left of school. We used to go to Meredith's to eat. Good food, inexpensive." I lived in trailer park No. 3. Some of the guys and gals and our wives used to go to a movie and go downtown, then go to the Bloody Bucket after the movie and have a beer there. They had a jukebox. 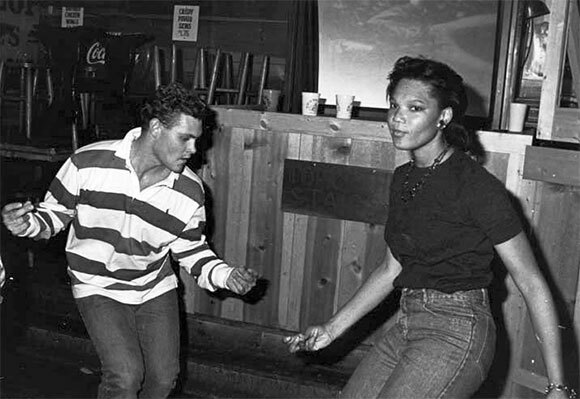 There was some dancing, but it wasn't primarily a dancehall." We used to go over to Riddle's Grill in Dublin. We went over there, ate sandwiches, drank beer, and then danced." Bryce's Tavern was nothing but a beer joint. We'd sneak out on weekends or after hours. I remember one time some upperclassmen came in. We all beat it out of there and knocked the screen out of the back window to get out." The College Inn was always a great place to get a great home-cooked meal. It was where Joe's Diner is now. It was one of those little dives that served great food." The Farmhouse [which recently closed] probably for 30 years was the preeminent place that students would go before things like Ring Dance, the formal dances, or any kind of significant social event. It was the place that alumni always made a point to come back to when they came here. It's also the place where the football team was fed the day before home games." My husband and I met at the Hokie House my first day as a freshman in September 1974. My friend Sue introduced us. We started seeing each other on campus and in the dining hall, and a couple of months later started dating. … My daughter went to Tech, too, and met her husband at Top of the Stairs." Ah, the famous watering hole, the Golden Gobbler. It was fantastic. On Friday evening, they offered beer-boiled shrimp—they'd boil shrimp in beer rather than water. It was a popular menu item, along with their homemade fries." Mr. Fooz was named after popular foosball games. There were a bunch in the back, as well as pinball machines and pool tables. Its main claim to fame was submarine sandwiches. Every Wednesday night, there was a happy hour, and, man, was that place jam-packed." Oh, Mr. Fooz. I went there every single Wednesday night my senior year, even if I had a test the next day. There was After Sundown, when disco was big. It was where the Tech bookstore is now. Some pretty big bands used to come to 117 South Main: the Nighthawks, Bob Margolin. One time I remember they were having an Elvin Bishop concert over at the coliseum. He came in with his manager at 117 afterward and wanted to play. They didn't believe him at first, but he finally played." There have been two times when Tech has won a football game that they've torn down the goalposts. Both times, don't ask me how, the goalposts ended up at Top of the Stairs." You felt like you were in a cavern, way down, enveloped by a dark, dank cave shaft. ... The walls were sprayed with a liquid foam that was allowed to dry into lumps and blobs that resembled stalactites and stalagmites. The final effect was an eerie, puffy, cozy atmosphere. Top it off with soft, multicolored floodlights and Crosby, Stills, Nash, and Young oozing through the built-in speakers, and you had it all." — John Cooper (psychology '72), taken from a description in his novel, "From Woodstock to Eternity"
The waiter would bring around a cart of raw meat. He'd put his knife on one position, and you could have it adjusted. And if you could prove it was your birthday, you got a free meal." 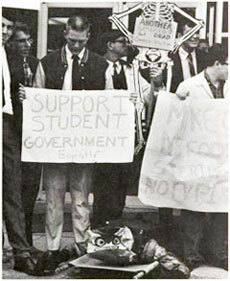 Anchored by a student in a cockroach costume carried around on a stretcher, a 1967 protest and single-meal boycott of the three campus dining facilities bemoaned reports of nasty critters in one of the facilities, particularly in one extra-juicy slice of pecan pie. To the students' delight, their boycott and protest received extensive attention in the local media—and earned a photograph in the annual Bugle of one protester toting a cardboard skeleton with a sign proclaiming, "Another satisfied? but dead Owens victim." 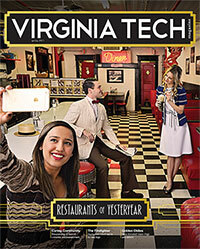 These days, Tech's dining facilities are routinely ranked as the best in the country. 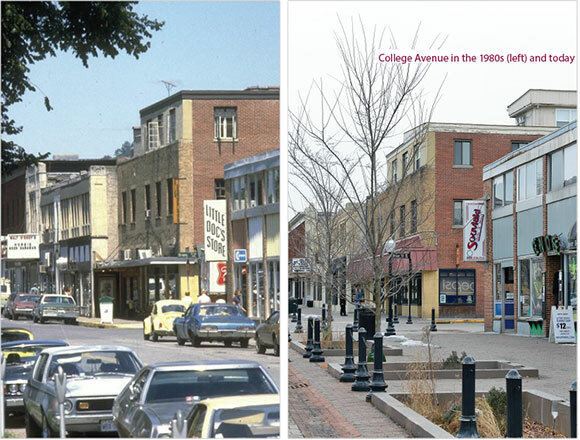 Four views from College Avenue and Main Street—including one taken between 1900 and 1919—capture a downtown vibe anchored by Blacksburg's restaurants. 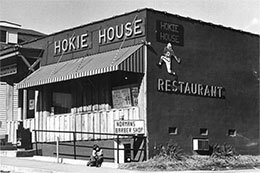 Virginia Tech alumni, whether they attended in the '50s, '70s, or '90s, still hold Blacksburg restaurants near and dear. Why? To paraphrase a folk dictum, it's because the way to a Hokie's heart is through his or her stomach. That's not just conventional wisdom—it's science. The parts of the brain that process smell and taste sit near the part that processes episodic memory, so smell, taste, and memory are linked physically and through neural connections, meaning that we tend to remember meals and their surrounding social experiences, said Rachel Diana, assistant professor in the Department of Psychology. Sensory inputs combine with the presence of good friends and pleasant circumstances to create vivid memories, especially those shared over food, said Susan Duncan, a professor in the Department of Food Science and Technology. "College is a lot of work, but you don't remember all that work—you remember the fun," Duncan said. "The studies and details of the projects you worked on, those are going to fade." The venues hosting all that fun—Blacksburg's restaurants—share a rich and varied history, due largely to their connection with the Virginia Tech community. As the university has grown and changed over the decades, so have nearby restaurants. 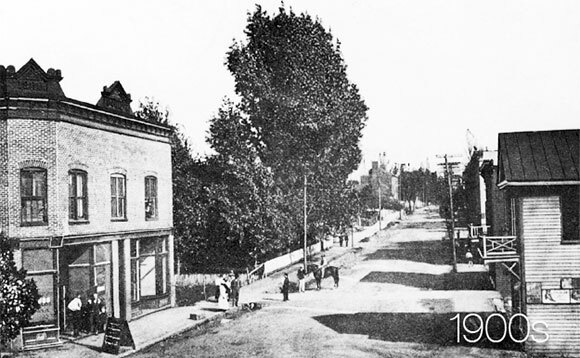 Early records indicate the presence of a tavern when Blacksburg was formally established in 1798. 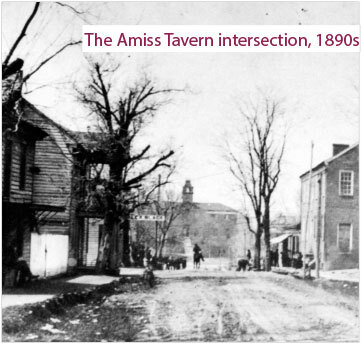 The records probably refers to the Amiss Tavern, built on the north corner of Main and Roanoke streets before 1818, according to a 1984 study by Daniel Pezzoni (architecture '84, M.Arch. '87). By the time Virginia Agricultural and Mechanical College (today's Virginia Tech) opened in 1872, a series of hotels also served food. 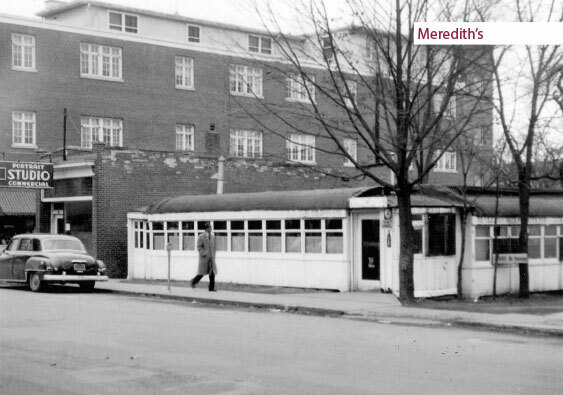 Before the college's first dining facility was built, cadets ate meals at the Blacksburg Hotel. In the early 1920s, Greek immigrant Nick Kappas opened his restaurant's doors at the corner of College Avenue and Main Street. A resident of Salem, Virginia, Kappas had regularly attended the annual Thanksgiving Day football game between Virginia Tech and Virginia Military Institute. "The VPI cadets talked him into coming to Blacksburg and opening a restaurant in 1921," said Chris Kappas, his son. "It was a typical southern menu—meatloaf and three vegetables, sandwiches and chili." The Kappas eatery eventually obtained a license to sell off-premises beer. For many years, as the only source of alcohol near campus, the restaurant attracted a steady stream of customers, which despite a Virginia Tech policy against the practice included faculty and even the occasional dean. "The cutoff time was 11 p.m., and people would be lined up down the street. People would give their money to the guy up front, and he'd go in and buy all he could," said Charles Johnson, owner of New Image Barber/Stylist. Nick Kappas and the Havelos family eventually opened Greek's Cellar and Greek's II. Today the first restaurant is still open and doing business as The Cellar. Other notable restaurants from the era include Meredith's, a street-car cafe that was located off the corner of College Avenue and Draper Street, and several drugstores with dining areas, including Center Drug and Corner Drug. In the '40s and '50s, veterans arriving in Blacksburg to study on the G.I. Bill often moved into trailer camps with their young families. For entertainment, Tech students often left campus, both for the beer and the female students at Radford University. The '50s weren't a time of drinking and dancing for everyone, though. 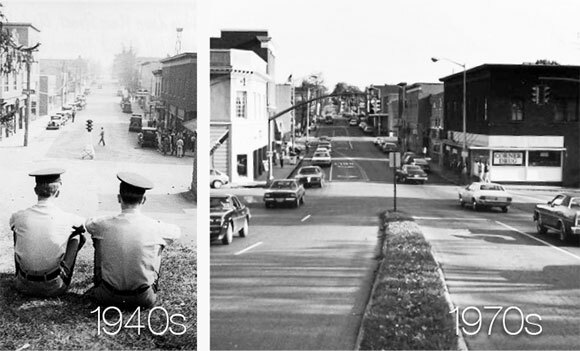 Blacksburg's restaurants still were segregated. Charles Johnson grew up in the nearby Wake Forest community that was founded by descendants of slaves on Kentland Plantation, now Kentland Farm. Johnson trained to be a barber at Christiansburg Institute, but three weeks after graduation, he was drafted and sent to fight in the Korean War. Upon his return to Blacksburg, he stopped at a restaurant near campus. He said that restaurant cooks, many of whom were black, would let black customers come in through the back doors and order food. "I went in the back door to get a hot chocolate and some donuts. I noticed they were having a conference in the kitchen. They were trying to determine if I was black or an international student. Those international students could go to restaurants around here, and the blacks couldn't," Johnson said. "They came out and poured my hot chocolate into a paper cup, put my donut in a bag, and told me I had to leave. ... The problem was, there were a lot of cadets in there. They knew I'd come back from Korea. They wanted to talk to me, and they told me they'd protect me, so I just stayed as long as I wanted." Attitudes began to shift during the civil rights movement in the 1960s. Johnson, who cut hair in the Tech Barbershop from 1956 to 1973, was one of a number of businessmen, clergymen, and other influential community members who observed the riots in such states as Alabama and, determined to prevent violence from overtaking their town, worked to peacefully integrate Blacksburg in 1962. Two years later, in 1964, Virginia Tech made participation in the Corps of Cadets voluntary, forever changing the atmosphere on campus. The number of female students increased, as did the number of non-white students. 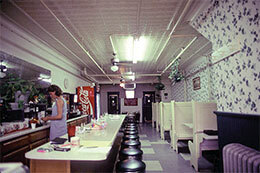 As in years past, restaurants played a central role in the community's social life. The late '60s and earlys '70s also saw the arrival of fast-food franchises—national names, such as Hardee's, but also regional franchises, such as Lendy's and Ray's. Two key downtown restaurants, Gillie's and Mr. Fooz, opened in 1974. Gillie's started out selling ice cream, soups, and sandwiches, but it quickly became a hippie hangout before eventually starting a slow transition in the '80s and '90s into the full-service restaurant it is today. Located around the corner on Main Street, Mr. Fooz was known for beer, sandwiches, and games. "You never quite knew what some of the staff would wear," said Ranae Gillie, co-owner of Gillie's. "We had employees who always wore sunglasses, or they'd wear short skirts with big holes in their stockings. I remember when the health department wanted the girls to wear hairnets and shave their armpits, a few just put hairnets over their armpits." Across the street was Dave's Hot Dogs, which sold food, but also attracted students with a 24-square-foot television that was especially popular during Monday Night Football. The social setting of restaurants led to a variety of connections, from best friends bonding to husbands meeting wives. Mike's Grill opened in 1976, in the space that was formerly home to the Sports Center. "Every year, at commencement, they always mention, when you come back as an alumni, there are two things you must always do: Come to Mike's Grill and go to Carol Lee Donuts. Every year, someone texts me in the middle of graduation and says, 'Hey, you just got mentioned,'" said Nick Varelos, the second-generation owner of Mike's Grill. 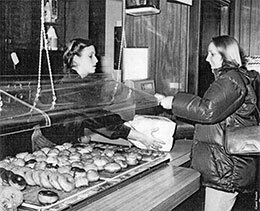 The '70s saw emergence of ethnic food options. Charlie's Chinese Restaurant opened on Main Street before it eventually moved to Christiansburg. By 1975, the Lotus Garden Restaurant was open in the University Mall in a spot now home to Hunan King. The China Inn, on Draper Road across from the library, opened around the same time, recently breaking its own record for deliveries in a day with more than 300 one Saturday. Chris Kappas opened Souvlaki in the early 1980s, at a time when customers weren't sure what a pita wrap or shish kabob was, he said. Mike Buchanan (sociology '89) went to work there, and one day when his future wife walked by the window, a mutual friend introduced them. Buchanan bought the restaurant in 2001. Mexican food took a little longer to establish a presence. In 1992, El Rodeo opened near the intersection of Main Street and Price's Fork Road, where it remains today. "The original El Rodeo is on Williamson Road in Roanoke," said Edgar Arellano, whose family owns El Rodeo. "My father, Ramon Arellano, and his brother, Rigoberto Arellano, came from California and opened up a location in Blacksburg. We knew the college was going to be growing. That's always a good thing to invest in, and that's what brought him here. In 2000, everything took off." For decades, students who lived on campus were required to buy 21 meals a week. That changed in the mid-'80s, when Tech altered its meal plans to offer more flexibility, creating a substantially larger market for local restaurants. "[The policy change] happened in concert with what was going on in the food industry and broader society: the growth of all these fast-food places and the broadening of restaurants to offer things other than hamburgers," said Ray Smoot, the long-time and recently retired Tech administrator. The '80s also saw the rise in popularity of Top of the Stairs. Opened in 1978 by Al Brauns and Allen Riffle, the restaurant and bar known as T.O.T.S. is a prime destination. By the '90s, other restaurateurs noted the upward trajectory of Tech's student population and opened new businesses, often struggling their first few years. "We opened Sharkey's in 1992, and it was horrible. It took four years to make it work. Everyone went to Arnold's, but the bathrooms [there] were horrible. So people would cross the street and come in [Sharkey's] just for the bathrooms. ... Finally, in 1997, we started selling 'super mugs,' which were beers in a huge mug at an inexpensive price. We did it all summer, and we started picking up more business," said Stephanie Rogol, co-owner of Sharkey's Wing and Rib Joint. The good news for alumni is that returning to old haunts—whether the Cellar, Gillie's, Mike's Grill, China Inn, Top of the Stairs, or anywhere else—can bring back memories, even if the building's name and ownership have changed. "If you encounter a smell you experienced in a previous part of your life, it calls to mind a really specific memory, as if you were in that previous part of your life again," said Diana, the assistant professor in the psychology department. "If you walk into a restaurant you went to when you were in college and the place is the same and the smells are the same … those sensory inputs all serve as cues for retrieving the event. It's mental time travel. It can feel like you're experiencing it."